Saturday 28th June was the third Awakening concert to take place at Paget High School, inviting a few new and younger spectators to witness the very best of electronic and ambient music. First up to play was Modulator ESP, making their second appearance at Burton’s venue. He started with a very moving and powerful display of weightless music, in conjunction with a spectacular video session where the audience’s minds were blasted off into space. Trips around the Milky Way and picturesque display of light, colour and sound erupting from Jez’s set. I could not help but feel that this set was produced to give the audience a sense of ‘greater meaning’ as they were captured in a video of time and space. A full 35 minutes of mind blowing music. A great start to a much anticipated concert. A quick 2o minute break in which refreshment were served providing an ideal time to reflect on Modulator ESP’s star gazing performance. Then back into our second session of the night. Next up was Pete Tedstone, who presented an invigorating selection of trance, spiritual and a psychedelic collection of fast moving and invigorating blend of several art forms. The mood moved from a very light and reflective contribution of sound to a cross-genre of both techno and emotion. This effect was mastered by Pete with tremendous success, in which for over 35 minutes, he captured the audience in a trance with a combination of apprehension, calming and contemporary instrumental fulfilment. This guaranteed the satisfaction of all ages in the audience. However this set had to come to an end in what seemed a very short space of time. The mood was very much upbeat as there was little time for reflection on such a vibrant set. The night was drawing to a close but was nowhere near finished as we entered into our final set with Astrogator +1. So, into our final performance of the night, this was an improvised set due to unforeseen and unfortunate circumstances of one group who were unable to make it, our thoughts go out to him. Astrogator kindly stepped in at late notice to provide the concert and its audience with three overloaded sets. Astrogator blasted the hall with artistic, surreal images full of raw emotion. The performance drew with the outstanding high standard of the previous two acts to create a whole new approach to electronic and ambient music. Pieces of surrealist artwork were revealed to the audience in stages of patterns and inverted colours, causing both the rhythm and mood changed. Tension gripped you on your seats; waiting for the music to climax whilst religious images and bursts of bold colours in capturing you on the screen. The artwork slowly faded out to begin the next stage of the performance. The finale included a special collaboration by Modulator ESP; Pete Tedstone and Astrogator to create what can only be described as an epic performance. All three artists rode on their emotions and intensity of each others vibe. A magnificent and thrilling experience to be apart of as each played their part as the melodies rumbled, notes danced, images flickered and hearts pounded. Colours lit the blank canvas of the hall, creating an almost extraterrestrial feeling, closely followed by an electric/gothic fuelled section from three very different artists. After over an hour of engaging, mood lifting and encore filled set, the concert was sadly over. All three of the groups were excellent and definitely changed my opinion on electronic and ambient gigs. I would recommend it to everyone who love music and like seeing local events and talented performers. So keep an eye out on the website or your local hall because Awakenings may be coming to a town near you! A truly inspirational collection and collaboration from all three of our acts! Awakenings second visit to Paget High school was a resounding success. Although the audience size was slightly up, such a quality multi-media event, with excellent music and visuals, deserves a larger audience. So come along and support the gigs! First up was 4m33s. The set revolved around a silent black and white movie depicting the making of Steel at the height of the British Steel Industry. As the steel process unfolded on the screen, the dark brooding soundscapes lamented the death of the Sheffield steel industry around Magna in Sheffield. The thirty five minute piece pulsed slowly with suspense building strings and industrial atmospheres. The gradually morphing ambience proceeded with an air of tension as the stark images of steel flashed across the screen. This was a very effective and brave piece of music to play live. It worked beautifully and succeeded in creating a sense of loss; a lament to the death of the steel industry. HyperEx Machina’s set came as a complete contrast. Here, we were treated to thirty five minutes of pulsating sequencer music that had the audiences’ feet tapping to the changing rhythms. Each short sequence was beautifully crafted and carefully developed with some excellent melodic lead lines to add to the effect. As the sequences rang out through the hall a slowly changing psychedelic pattern morphed in visual harmony on the big screen above. I can’t think of anyone who loves Berlin school sequencer music who would not have enjoyed this set. It was over far too soon! Next, 4m33s and HyperEx Machina combined to form Entity. 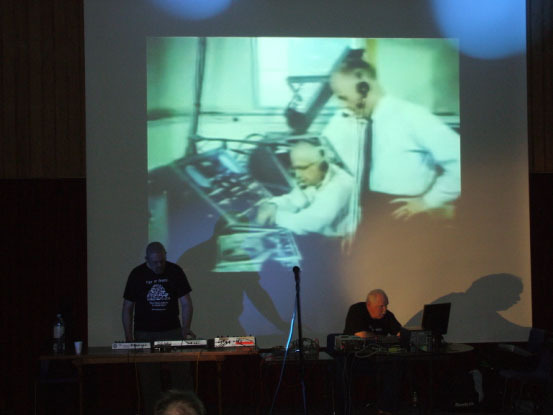 The third and main set of the night weighed in at sixty five minutes of live and largely improvised electronic music. This set was different again in that a large proportion of the music contained the guitar work of HyperEx Machina complimenting the sequences and atmospheres created by 4m33s. The piece immediately built up into an intriguing sequence with melodic lead lines adding drive and pace. The screen showed a black and white film of how chimpanzees were used in space before the first manned space flights took place. The driving sequences and atmospheres created by the music made the images a little unsettling. The unsuspecting chimp found himself strapped into a metal container ready for the space flight and taken to the rocket ready for launch. After a few minutes the mood changed, the sequence slowed as preparations for the space flight took place. The mood became darker as HyperEx Machina reached for his guitar and added fuzzed staccato wails of protest, seemingly on the Chimps behalf, over darker and more unsettling atmospheres. At around twenty five minutes the melody returned with a sequenced piano backdrop. The guitar soloed over the top with a clearer and more traditional sound. The space flight continued and at the half way mark the guitar work became more intense and memories of Edgar of TD fame were evoked. A quieter period followed and lush chord pads introduced the next section. This quickly led to the introduction of a slow and rather staccato sequence. The guitar returned, now with echo added. The guitar work intensified and the sequence developed into a crescendo of sound as the chimp returned to earth. Spaceflight over, a short period of desolate wind sounds ushered in the final section. Here a beautifully melodic sequence entered the fray and became more intense and complicated as both musicians concentrated on the keyboards. Sustained notes added flowing lead lines over the sequence, as the piece came to its conclusion. We had arrived back on earth! The encore involved a slow and simple sequence. A dark and broody atmosphere developed as the guitar wailed its angst in accompaniment. Whooshes and burbles appeared from time to time as the guitar echoed through the hall. After twelve or so minutes the sequence faded and the second Awakenings gig at Paget was over. Once again it was clear that the excellent visuals provided by the two musicians had complimented the varied music presented on the night. If you took the opportunity to buy a VT and haven’t done so already, download the full gig. It’s well worth it! This was the first concert at the new venue in Burton, and it can be regarded as an excellent start. Modulator ESP started the evening with a set nicely supported with high quality projected images that really added something to the music. Modulator ESP has produced many ambient pieces, but for this night introduced some quality sequences to up the tempo. Simple and straightforward, they really hit the mark. The sign of a good concert is that the performer is really enjoying himself, and Jez seemed to enjoying himself so much, he forgot to stop, and the audience were presented with the start of the image loop again, though nobody seemed to complain. The second set started with Modulator ESP and Vietgrove performing together, using a rather old black and white film of Faust as a backdrop. Personally, I think this worked incredibly well, and the film and music combined to make the event more enjoyable. The introduction of Vietgrove (synths and guitar) added more strands to the music, with all three musicians combining well together, and looking like they play together all the time. Whilst not a great fan of guitars in EM, having listened to some god awful guitar solos on TD bootlegs by Edgar Froese, I quickly became impressed by Mark’s guitar work which fitted hand in glove with the two synth players. At times atmospheric, at times more driving, it always seemed to hit the spot. I’m a convert. Norman’s sequences were simple, clear and engaging, giving Mark and Jez a good basis to layer over. The third set started with just Vietgrove on stage, (still playing along to the Faust film), in the same vein as the second, but perhaps a little more sparse due to Jez now being in the audience, but still very enjoyable. The only criticism one could have is that they finished the set before the Faust film finished, so the audience was left not knowing the ending, but only a minor issue. Modulator ESP and Vietgrove came together for a storming improvised encore, which finished off the night nicely. Whilst Jez swore it was improvised, you would not have believed it, such was its quality. In summary, the night started on a high, and just got better. Congratulations to the guys on such a great concert. It provides a high benchmark for the next Awakenings. The venue was excellent, with a separate area for people to retire to between sets, where some pupils were selling refreshments as part of a business project. I got there quite early so I could get set-up and have plenty of time to get everything sorted. Dave and Tony, the guys from the school, were also extremely helpful and Dave did some announcements between the sets and Tony sorted out the lights and sound. The projection system was great, it was well worth the effort involved in putting my little spacey slideshow together. It was also pretty cool playing along to the opening of Faust and watching Norman and Mark play along to the rest of it. The PA was pretty good too, especially up on the tiered seating, where there was a great view of proceedings. The audience was small, but very appreciative. I think everyone who was there thought it went pretty well. Well, last night was another rousing night at the Brudenell Social Club (Clean Glasses Every Time) in Leeds. Amanda and I arrived and paid our way in (Hi Marrion, Thanks for helping out) and sat down just as Steve Munslow, aka HyperEx Machina kicked off. And what a set. The club was all filled with smoke from a smoke machine, to the point that I couldn't use my flash, as all I got was a bright blob of light. Thankfully, putting my camera on ISO 1600 allowed some lovely shots without the flash. Steve's first set -- or was it just one long song tied together by appropriate places for applaus -- was simply astounding! Steve sat there playing with a very small box as his only visible controls and sound was pouring out of the very walls. At times a pounding deep bass sound was almost shaking my glass off the table. Amanda and I were sitting there looking at Steve and wondering how all this was flowing out. It was about an hour long set, and it was incredible. If any of you in the U.S. haven't heard of HyperEx Machina and are interested in his music, you can access it through the Awakenings website http://www.ambientlive.com/awakenings/ or through www.ambientliverecords.com. Steve's music is billed as deep, drifting, ominous and intense and it is all of that, and more. Little melodies break through here and there, only to be demolished by a wall of gut wrenching sound pounding down the walls and falling over on top of any melody before the trains arrive on the tracks and the space ships take off. At least that's part of where my head was. Excellent!! Thanks Steve, if you're on this list. Last and certainly not least was David Hughes. A memorable day for Dave, as he had had an altercation with his dog early in the day, which resulted in Dave losing the fight and the dog being crowned champion. <g> Dave had a very nice setup in the front of the stage, with synths and sequencers, including a Zeit.... (For any interested gearheads out there.) Overcoming some slight stage nervousness, Dave launched into a scorching set of music, joined by Norman Fay on guitar and sounds. Then Dave treated us to more work where he was accompanied by his sequencer (did I get that right?) which was beautiful stuff. It's always amazing to me that anyone can accomplish anything without extensive notes, frequent breaks and help from a crew of 30 or 40, or at least three or four. Dave was moving from one keyboard to the next, and really doing a bang-up job. Norman Fay and Julie, Dave's friend, joined him at centre stage for a version of Tranquility Bass from the "Tranquility Bass" days and cd. It was really nice. Then Dave finished up with another short piece and we ended almost exactly bang-on on time. All in all, one of the best musical bargains I've ever been privy to. And besides that, I came away with 11 cds at decent prices to continue my education! The Brudenell is not the most enticing of sights, but somehow last night for about three hours, it was transformed into a magical place where transformation and love of music took over. Nobody was there to get rich, but there was an incredible amount of effort and music that flowed out of that place. I was at the Awakenings gig in Leeds last night with my friend Amanda, and what a rousing night of music it was.. The whole thing kicked off promptly on time with Jez Creek playing a delightful and powerful 30 minutes worth of music solo. The only thing wrong with it was the fact that it stopped! Melodies, sounds, sequencers, all there and all beautifully done. Well done Jez!!! Next up was a solo effort by Steve Humphries. Two different tracks, totalling around 30 minutes. Both wonderful to listen to, but very different. What fun it was to be sitting about 20 feet away and watching all the twiddling of knobs and keyboard playing going on. But the real prize was the music. Who cares what anyone is doing as long as it sounds as good as it did! Good job, Steve, and a pleasure to meet you. I think Dave Law, in his review of Astrogator's first effort together, mentions that Steve and Jez are two really "nice blokes." I would certainly second that. Both very nice, and a lot of fun. One thing that is missing from cds is just how much fun people are having when they play. Lots of wonderful energy bouncing all about. That brings up The Omega Syndicate. They were the third act, and what a wonderful collection of music. They played two long tracks and a slightly shorter third track. During the second track, at one point, I looked over at my friend, Amanda, and realized that the music had kidnapped her and taken her far, far away. She was swept up by the glorious sequences and guitar lines, and in her words, "was away with the fairies"! She is a music lover, and likes all kinds of music, but I think this was the first time that she really got why I love EM so much. Again, listening to cds doesn't do justice to the energy that's available at a live concert.. All three tracks were full of energy and moving right along, with music and feeling to spare. Dave Gurr, who is a delightfully playful entertainer and a very nice fellow, strapped on his little mini keyboard and did some live music without sequencing it. (It brought to mind a night in Cleveland about 30 some years ago in a small hall watching Gary Wright with a portable keyboard moving around the stage. No rhythm at all.......) Not Dave's problem in the least. He was moving and bobbing totally into the music. Guitar lines woven in and out of the music and and percussion moving in the background brought a really strong melodic content to the music. Wow, great stuff! And as if all of this wasn't enough, up next was Astrogator (Steve and Jez together). Astrogator took us on little journey for about an hour or so. The first piece, or at least part of it, is contained on a new cd by Astrogator entitled "Dreamlight." This is a limited edition cd by Astrogator, I think limited to 50 copies. (I have number 9). If anyone wants it, get hold of Jez or Steve and arrange for it. Great cd recorded in June of this year at Steve's. Again it was so different to be able to watch people play and truly appreciate the amount of work that goes into it and how much fun it is. Jez and Steve were each lost in their own part of the music, and somehow checking in with each other and keeping it together. Excellent set that ended up the evening. After the music, there was a raffle, and a number of wonderful things were available, including a framed print of the cover of the new Omega Syndicate cd, Apocalypse. Beautiful! The cost of the cd is worth it for the artwork alone, but the music will certainly be the icing on a rich cake. £10 pounds for entry to the Brudenell Social Club for a wonderful night of great music, was the best way I've ever spent £10 in the UK. I must admit when we first drove up to the Social Club, I was taken a bit aback by the area, but not to worry. Just up Cadigan was the Grove Cafe, for tasty curry and lassi before the show. If you live within driving distance of these events and don't bother yourself to go, you are definitely losing out on one of the best bargains around in music. Amanda and I drove over from Manchester and it was well worth it. This is the first time since I've been coming to the UK that music happened at a time when I could attend and it made up for a lot of misses. I think the next Awakening event is in the end of October, and I'm trying to figure out how to get back over here then so I can attend. <g> Thanks John and everyone for all the hard work trying to make this be viable. On Friday evening I drove from my home near Doncaster up to Leeds for the latest in the Ambient Awakenings concert series. This concert featured a set by Richard Wentk (Awen) and the second half of the night was filled with lots of Binar rhythms. This was my first visit to one of the Ambient Awakenings concerts which take place in one of 2 locations (Nottingham and Leeds). The Leeds venue is a club in Headingley (Leeds). The directions to this venue on the official website are excellent. But the drive towards it will be an eye opener to anyone who not visited this area of Leeds before. But once inside the club the concert room is really great. It has an appropriate size stage with comfortable seating around it. The bar is to the rear. The concert room has decent lighting to suit the mood of the music. I know Richard from the Intelligentsia mailing list and was one of the few who attended the Intelligentsia concert at St Cyprians Church in London. Richard performed a solo set at that concert too and then went on to perform as part of Intelligentsia (Mirai and friends). In both cases Richard started with very spacey music and visuals to match. This style lasted nearly half an hour and I wondered what the other people in the audience thought of this style ... bearing in mind that most of those present would have probably turned up to hear Binar in action; whose music does tend to more more sequencer based and certainly more upbeat. However, Richard's music gradually added sequences and more driving rhythms. The pace gradually built up and up over the next 30 minutes. This style certainly grabbed the attention of the listening audience. Richard slowed down the pace towards the end of his set. The audience applauded and seemed to have enjoyed this set from someone who may have been very new to them. I am one of those people who has followed both Paul and Andy's work through the years; both their solo work and their work together (as STDM and Binar). In each joint album they release and in each concert they perform I have noticed that their music is becoming more and more upbeat. Their trademark sequences, rhythms and sounds were all present but each track they played seemed more up tempo than before. My personal favourite that they have released together is still Ramayana; with those excellently dreamy hypnotic pieces. A lot of the music I heard at this concert would not have been out of place as part of Paul's Joint Intelligence Committee album; with Andy's excellent keyboard work as an extra layer. I spoke to Paul and Andy about the release of their next album (which I hoped they might have released at this concert). They told me that the new album is ready to produce, they just need to decide how many to have made up. Producing these CD's is always a financial risk. So, how about an advance orders list guys ... if we put the orders in when you tell us the album is ready then you know how many to produce. And, because this new album features music from their last concert at the Space Centre, then I know I want my name on the orders list. 2 weeks ago, around this time, we were having breakfast at a "little chef" restaurant from Hull to Leeds. A fine healthy UK breakfast with bacon, eggs, toast and 2 sausages, as much cappuccino as we wanted, a nice trip on a ship behind us and a great gig ahead. The whole trip was very easy going and even in the hotel we had a bonus. I reserved a double room for us but I got a suite. With 4 (!) beds, no idea what they thought we had in mind!? The club was easily found in Leeds and although the stage looked a bit small we started to build. Jez, who would open the evening with a set (a very good one I must say) stayed on the floor. So we had the whole stage to our elves, thanks for that. Many familiar faces came in from 18.00 on. One of the first being Stephen Humphries, mr Create who helped us build the PA and all. The concert itself was good, many up tempo pieces with a lot of new tracks (5). The audience, not as many as we had hoped for, liked what we did. So we played a nice encore that also went in well, pity we had to stop due to a noise curfew. Still we had a great time. Left the venue around 00.30 for a bite and then back to the hotel. Next day was nice and mellow, we had to be on the boat on 19.00 so we had all day to visit Hull. We soon found out that was plenty of time :-). There was somewhere a remark that the best thing in Hull was the railroad and highway out of it. Sunday morning back in Rotterdam and at 11.00 we embraced the kids and wife again. We had a lovely time in the UK, a pity only a few came to watch but from the reactions I think all enjoyed the concert. We certainly did and I hope it won't be 10 years again before I can play again in the UK. Seriously, John Sherwood is putting mighty efforts into getting this club going, for the love of the music. I witnessed a tremendous concert by Jez Creek (Modulator ESP) and Ron Boots (brought alive by some great e-drumming !) which proves that this music can be a living breathing beast. There were nowhere near enough people there which is a real shame. The club is terrific, great acoustics, nice layout and a bar. The area of Leeds it's in may not be exactly The South Bank, but it's easy to find off the motorways and would only be about £3 in a cab from the train station. Last Friday evening we were once again at the Brudenell Social club in Leeds for the gig featuring Modulator ESP and Ron Boots. At £4.00p per ticket probably the best value for money available. John's frantic clicking of his remote to get the smoke machine to work was worth the ticket price alone. The evening opened with Modulator ESP AKA Jez Creek. His set for me was marred at the start and end of his first piece. In trying to find the limits he went slightly too far and entered the distortion zone. However the overall set was a joy to listen to. Having several of Ron Boots albums and seen him live before we were expecting great things from the line up. This time he was accompanied by Harald v d Heyden, a percussionist extrordinaire. We were not disappointed. The sheer range was to die for. Having just finished a course of antibiotics containing Antibuse I was stone cold sober, ( I do not smoke suspicious substances either), but at the end of the evening I was really high. Yes a great big vote of thanks is due to John and Jez, without who great gigs like this would not happen. They need our support if gigs of this calibre are to continue. Lets see a far bigger turn out for their next offering on June 10th. So fans support these guys or risk losing a chance to see groups at this low low price. Brilliant concert last night - both acts did excellent sets. See you all at the mini-festival in June. Big up to both the artists and organisers,especially nice to see Ron and Harold play the uk again. The lack of live attendees at em gigs in this country has been a problem for years now, it seems we have a very apathetic (or pathetic!) fan base who seem willing to buy the recorded output but just will not travel to support the artists. Nice to see Trev, Ross, Steve D, Dave G, and anybody else I spoke to. Again thank you to the guys responsible for putting it together, you deserve better. Ron and Harold then played a superb and enjoyable set. Most of the music was in the Klaus Schulze style and the live drums really made the music bounce along. Top marks! Once again, it was a pity that there weren't too many people in the audience but that certainly didn't dampen the enthusiasm from the artists or the people watching. Anybody who didn't go really missed a memorable evenings entertainment. It was also good to meet up with fellow audience members and have a chat. Finally, big thanks to John & Jez for putting these events on - they really deserve to be supported better at future gigs. I can't wait for the next one in June.